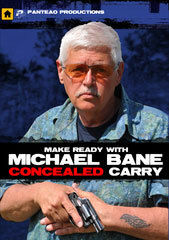 The Michael Bane Blog: I Can't Believe It's Almost Monday Again! It was a perfect day for a match! Also a perfect day to see old friends I haven't seen in a year. Picking up the cowboy guns after a long period of ARs, semiauto pistols and shotguns was really really fun…I guess you can call them old friends, too. I did change rifles…when the Mirouku 1873 Winchesters came out a couple of years back, I ordered on immediately, because I wanted 1873 Winchester roll-marked "Winchester," even if it was made in Japan. Nothing against the Ubertis…I've shot the crap out of them over a decade or so, and they are fine rifles. When I got the rifle I sent it to Ken Griner at Griner GunWorks, who has done all my long gun work on the cowboy guns for years now. I told Ken not to completely "cowboy competition" it out, which was definitely the right decision. 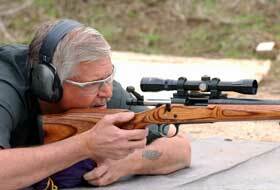 The Griner Winchester is smooth, smooth smooth and was a dream to shoot. Heck, a color-case hardened Winchester Short Rifle may well be in my future. Well, really I'd love to have a Mirouku Winchester 1892 in .44 Magnum after a little slicking up. Well, if it started raining money, I would go for one of my friend Val Forgett's Navy Arms Winchester 1873 factory customs — Turnbull color-case hardened, factory short-stroked, excellent wood, and a flat shotgun-styled buttplate. It is a damn nice rifle! Anyway, I had a wonderful match, hobbling to 12th place out of 32 shooters. Luckily, one of the stages was "stand and shoot," and it gave me a chance to smoke. I have to mention that my Sweetie, who hasn't touched a cowboy gun in almost a year, finished 5th overall and first woman. And she looked cool doing it! BTW, you mentioned posting on Facebook. Thanks for you daily email and blog. There are a lot of us who for one reason or another don't do the drama over on Facebook. And when given the chance to finally have the freedom that their Scot' forefathers fought for, the survivors decided to stay as subjects to the British Crown. The lure of Socialism and perpetual care was just too great for them to resist. No different than the Leninists that betrayed my family and all that they fought for in Russia. A Cossack I remain. Never again! 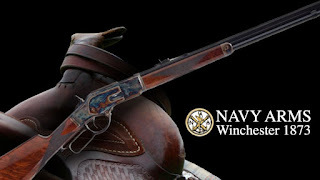 Followed the link to the Navy Arms 1873 Winchester - good Lord that color case-hardened rifle is one of the most beautiful things I have ever seen. Just fantastic. Thanks for the post, these rifles are simply an amazing things to have for yourself. These firearms are supposed to be used for safety and security of one and all and not for hurting others. You people can also take help from the MA Gun License to know about guns and training in detail and with ease and along with all the legalities.